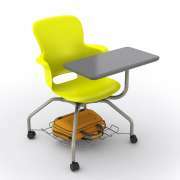 Hertz Furniture&apos;s student chair desks offer excellent comfort and convenience. 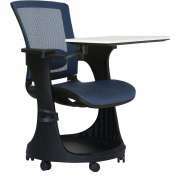 They eliminate noise from dragging chairs and the hassle matching chair and desks heights. We have great combo desks in a selection of sizes, heights, chair materials and work surfaces. How can I get an attached desk and chair? Our tablet arm chairs come in a variety of styles that are appropriate for both educational and professional settings. They provide a convenient writing surface for lessons, seminars and special events. 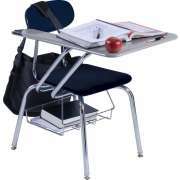 Academia student chair desks are backed by an exclusive Limited Lifetime Warranty for many years of worry-free use. 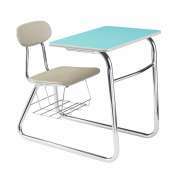 How can I make sure that school chair and desk heights match? 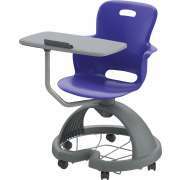 Chair desks offer a convenient setup for any classroom. Rather than worrying about matching chairs and desks, you save time and money by purchasing a perfectly-proportioned combination. You can choose your ideal desktop and chair materials and be sure that they will remain connected. 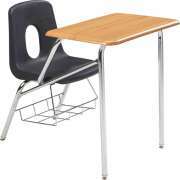 Combo desks are available in a variety of heights so they can be used from elementary school through high school. 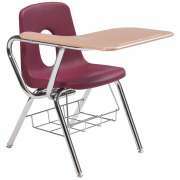 What is the best material for a school desk surface? 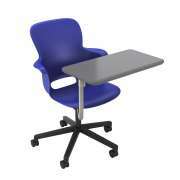 Work surface material is an important consideration when purchasing student desks. 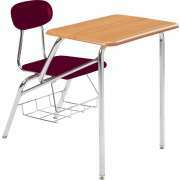 You want to make sure that the desks will last for many years and won&apos;t become easily damaged by regular student use. Hertz Furniture has three surface material options: WoodStone, hard plastic and laminate. Each material has its merits. The optimal material for your institution depends on your unique needs. Hard plastic is tough and sturdy, which makes it a great choice for student chair desks. It has a very high degree of damage resistance. It resists dents, scratches and stains and is even impervious to sharp objects such as pen points. WoodStone has similar damage resistance to hard plastic, but is lighter and cheaper. WoodStone is an Academia exclusive. 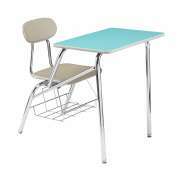 High-pressure laminate desktops are the most budget-friendly option for school desks. They are significantly cheaper than other materials. Laminate is scratch and stain resistant and wipes down easily. 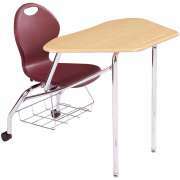 It is a great option for any institution on a tight budget that still needs high-quality desks. of course, if you do have a bit more money to spend on tablet arm desks, WoodStone and hard plastic are definitely preferable. 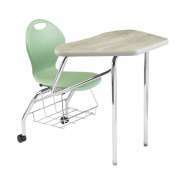 What is the best school chair for a combo desk? 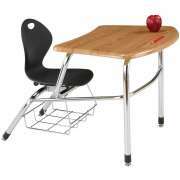 Combo desks also come with a number of different classroom seating options. Hard plastic chairs are extremely durable. Polypropylene chairs feature a comfortable waterfall front and vented back. For a modern look and supportive feel, try the Inspiration Series. 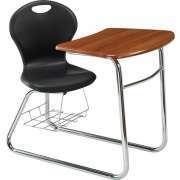 Integrated lumbar supports and slightly curved sides ensure that students are properly supported. Inspiration student chairs include 17 reinforcement ridges in the back so students can lean back without damaging the chair. The Inspiration Series comes in a great selection of vibrant classroom colors. 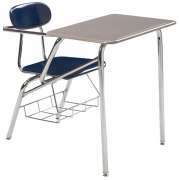 Should I get combo desks or regular school desks? 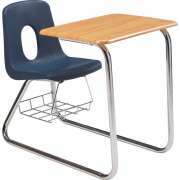 Chair desks have many great benefits. They keep a classroom looking neat, without requiring students to push in their chairs at the end of the lesson. They also offer convenient features such as under-seat bookbaskets. This is a preferable option because it eliminates distractions while keeping notebooks, textbooks and other materials close at hand. With bookboxes, students can play inside their desks and bring unnecessary items into the classroom which are not within easy view of the teacher. Book baskets are easy to view, so teachers can ensure that students are not coming into class with distracting items and unrelated materials. They provide immediate access to books that are needed for class. Students can simply reach under their chairs and pull class materials out as needed. Tablet arm chairs offer the added benefit of providing a comfortable place to rest your arm as you write. They can be ordered in both right- and left-handed configurations. This convenient design is helpful in educational and professional settings alike. Where should I put combo desks? Tablet-arm desks aren&apos;t just convenient in the classroom, they can also be useful in an auditorium, or even in a business setting. The XL series offers a larger seat and fabric upholstery that is appropriate for professional and educational use. Tablet-arm folding chairs can be set up in no time, to turn any room into a functional study space. Linked seating from OFM has a sleek attractive appearance that is great for an auditorium or social hall. 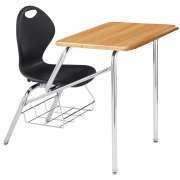 It facilitates neat rows of chairs, while providing a fold-down writing surface. The work surface can be moved away when not in use, and remains readily-available when needed. This is the perfect solution for a space that sometimes houses conferences and academic events. As an added convenience, the vinyl seats and backs are also easy to clean. How can you make sure that chairs and desks match class size? Starting class late because there are not enough chairs in the room can be very frustrating. Making sure that the number of chairs and desks in the room corresponds to class size is critical. 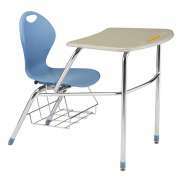 Chair desks make it easy to match up the number of chairs and desks in the classroom, and are not likely to be taken out of the room when someone needs to borrow a chair. Hertz Furniture&apos;s great selection of chair desks, school chairs with arms, combo desks and tablet-arm chairs is sure to meet your needs -- and then some. With so many options available, it is easy to become overwhelmed. Luckily, you can call the Hertz Design Center today for a free consultation that will help you determine the optimal choice. Free samples are available for qualified organizations.